I have a major girl-crush on Tarina Tarantino; I love all things her, from her pink hair to her ridiculously girlie jewelry line. I was thrilled to hear that she had a makeup line a few years back, but at the same time wondered if it would live up to her aesthetic of if her name was simply being used. I have been lucky enough to try several of the products in the line and can honestly say that you can tell she has worked as a makeup artist prior to creating it. The colors are highly pigmented and the packaging is gorgeous (I'm a sucker for a good package, tee hee). 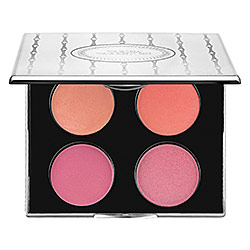 The Dollskin Cheek Palette is one of the newest additions to the line. It contains four cheek colors that are all very wearable, ranging from a dusty pink with a bit of sparkle to a sherbet colored peach. At $45 it's not inexpensive, but as I've discussed in the past, a blush palette is a great way to have several different blushes on hand for a fraction of the cost of purchasing them individually. And a palette will likely last forever, or at least a year or two.